Our nation proved this with Alcohol Prohibition in the 1920s, but we just didn't learn. The War on Drugs is a futile and nightmarish rerun of a previous mistake. 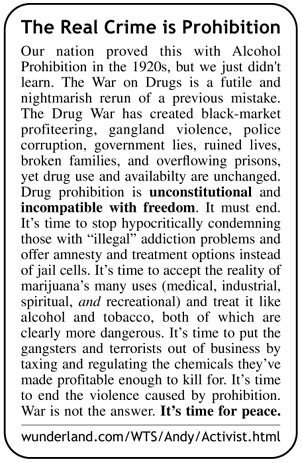 The Drug War has created black-market profiteering, gangland violence, police corruption, government lies, ruined lives, broken families, and overflowing prisons, yet drug use and availabilty are unchanged. Drug prohibition is unconstitutional and incompatible with freedom. It must end. It's time to stop hypocritically condemning those with "illegal" addiction problems, and offer amnesty and treatment options instead of jail cells. It's time to accept the reality of marijuana's many uses (medical, industrial, spiritual, and recreational) and treat it like alcohol and tobacco, both of which are clearly more dangerous. It's time to put the gangsters and terrorists out of business by taxing and regulating the chemicals they've made profitable enough to kill for. It's time to end the violence caused by prohibition. War is not the answer. It's time for peace. This essay was written by Andrew Looney and is available as a card-sized handout. It was also included in Stoner Fluxx.